Cardinal George Pell is appealing his child sexual abuse convictions on three grounds, including a “fundamental irregularity” that prevented him entering a not guilty plea in front of his jury. Source: The Australian. The Court of Appeal on Friday released Cardinal Pell’s grounds for appeal against his December conviction for sexually abusing two 13-year-old choirboys at St Patrick’s Cathedral in East Melbourne, when he was archbishop in 1996. “There was a fundamental irregularity in the trial process, because the accused was not arraigned in the presence of the jury panel as required,” the appeal, filed by Cardinal Pell’s barrister Robert Richter QC, reads. Cardinal Pell also takes aim at the reliance of the jury on only one victim’s evidence. “The verdicts are unreasonable and cannot be supported, having regard to the evidence, because on the whole of the evidence, including unchallenged exculpatory evidence from more than 20 crown witnesses, it was not open to the jury to be satisfied beyond reasonable doubt on the word of the complainant alone,” his first appeal ground says. If the Court of Appeal accepts that, it could dismiss the case. He also argues County Court Chief Judge Peter Kidd erred in preventing the defence from using a “moving visual representation” of its argument, claiming the events were impossible. Prosecutors objected to the visual, comparing it to the video game Pacman. 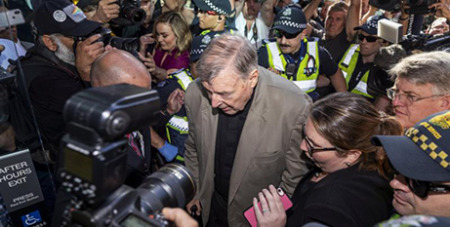 Cardinal Pell, who is in custody, is expected to pursue the appeal after he is sentenced on March 13. Meanwhile, bishops and priests across Australia addressed their congregations at Masses over the weekend, following news of Cardinal Pell's conviction last week. He said some people had raised “serious questions for the appellate court to examine’’. Melbourne Archbishop Peter A. Comensoli told a subdued congregation at St Patrick's Cathedral yesterday that the Catholic Church in Melbourne has reached a “moment of Golgotha’’, the site of Christ’s crucifixion near Jerusalem. The archbishops repeated apologies to victims who had suffered at the hands of clergy and other church personnel.